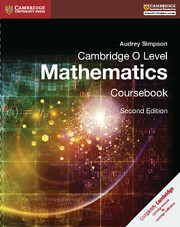 This resource provides a complete course for developing and practising the skills required for the Cambridge O Level Mathematics syllabus (4024). The content has been written to give students the confidence to use a range of mathematical techniques. It contains detailed explanations of concepts, worked examples and exercises and can be used in the classroom or for self-study.